You will find in this article only tools that are supposed to be used for free in the long term. We do not list tools that offer only a free trial based on duration or the number of retrospectives. We will also only mention the tools that have features specifically dedicated to Scrum retrospectives. There are many other tools that Scrum teams might use, from video conferencing platforms to online whiteboard software. Mentioning all these tools will result more in a book than an article. If you want to add a tool that fits these requirements to this article, just let us now using the contact form. Free retrospective tools for distributed scrum teams listed in this article are IdeaBoardz, Fun Retro, goReflect, Pointing Poker, ScatterSpoke, Scrum Toolkit, Sensei, Sprint Boards, Stormboard. IdeaBoardz is a free online team collaboration tool. It allows teams to collectively gather inputs, reflect and retrospect. It is especially useful for distributed teams. For Scrum retrospectives, you can create two types of boards: standard or starfish. More board options are available (pros & cons, to-dos) that could be also useful. You can edit the titles of the sections of your board. The interface seems very intuitive, but sometimes I ended up in some situations where I didn’t know how to exit gracefully, for instance when I focused on one sticky note to vote or update it. The updating process works however fine, so you will not loose your updates if you have to take an “emergency exit” from your board. The board has some filtering and ordering features if there is too much information on it. You can export the information of your board to a pdf document or to Excel. Fun Retro is an open source tool based on Node.js that provides a retrospective board. An online version exist also where you can directly use the tool. Fun Retro provides a basic template that you can then customize by adding additional columns or changing the name of them. You can have multiple people involved by simply sharing the url. There is no explicit saving mecanism, but the you can come back to your board using its url. You manage the retrospectives topics and actions using simple colored cards. A “like” button on each card allows participant to express their opinion on its content. You can also export the retrospective items and their votes in a simple text format. goReflect is a free online retrospective tool that is based on the starfish model for retrospectives using Start, More, Continue, Less and Stop. You can create as many boards and invite as many board members as you like. You can also be invited to other boards by other goReflect users. When creating a board you can choose from one of three predefined templates or create your own with the custom template option. Once a board is created, it’s template cannot be changed. Each board requires a title, and since the board is perpetual, using the team’s name is often a good choice, but the choice is yours. goReflect wants to promote a continuous and real-time approach to retrospectives so that a board is always active so it spans multiple sprints, iterations, etc. Pointing Poker is a tool that allows you to share online planning poker and retrospective sessions. You don’t need to register and the tool comes with a little “twist”: when you navigate away from the session’s page, the information about your planning or retrospective disappears. Even if you register, there is no way to save the results of your session. Both the planning poker and the retrospectives work in a simple way. You start a session and you can invite other to participate. You then have the possibility to discuss things that you want to start, stop or continue doing. You can switch between “Entry” and “Review” modes. ScatterSpoke is a free online retrospective board that work in a simple way. You register and then you can create a board that contains the three basic questions of a Scrum retrospectives: “What went well?, What didn’t go well?, What needs change?” You can create item and team members can vote on them. You can send invite to form your team through emails. Different options exist to sort the retrospective items. Scrum Toolkit is a free online tool for distributed retrospective. Only one person of the Scrum team is required to register at Scrum Toolkit. The team members can join a retrospective session without registering. Retrospectives are called “games” in the Scrum Toolkit. You can choose between two models of retrospectives: the “What went well? & What can be improved?” or “Start doing, Continue doing, Stop doing”. After the board is created, you simply share its specific url to the other participants. Each participants can add items that are then grouped in “buckets”. Participants can then upvote the three items which are most important to address in the next sprint. The ScrumMaster can monitor if everybody voted. Sensei is an online Agile tool that helps teams perform retrospectives in a structured manner, from assessing the last sprint to assigning actions to member of the teams for improvement. Using theories of behavioral psychology and game design, Sensei’s clean, uncluttered interface provides users with an environment to collect thoughts, shape them, measure progress, and take action if necessary. You can define user and teams simply by providing emails addresses to the tool. 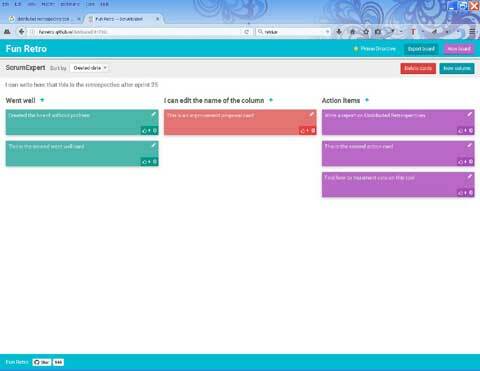 Then you can schedule a retrospective on the tool that will send the information to the member of the team. Sensei will guide the team through each of the five main activities in the retrospective so that team members can focus on the discussion. You can control the flow by using timeboxing, adding time to the clock, pausing it, or advancing to the next step when necessary. A summary report provides you the average rating of past retrospectives to assess your progress. 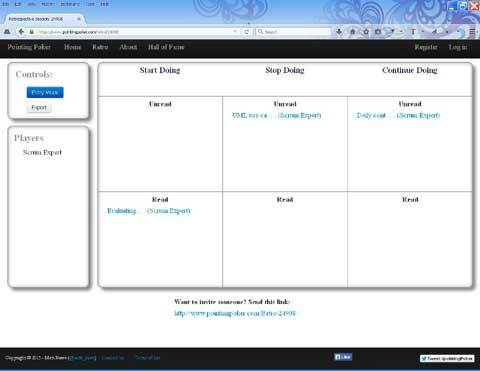 Sprint Boards is a free online tool for Scrum retrospectives. This tool is built with Bootstrap 4 and Vue and pays special attention to keyboard shortcuts that developers should appreciate. There are keyboard shortcuts for adding and saving cards, and a double-click shortcut to quickly edit a card. When you’ve finished your retrospective, you can lock your board to prevent somebody to make further changes. This is great for Scrum masters that need to review past retros. Stormboard is a commercial online brainstorming and collaboration tool. It offers a free plan with limited features for team that have up to five members. 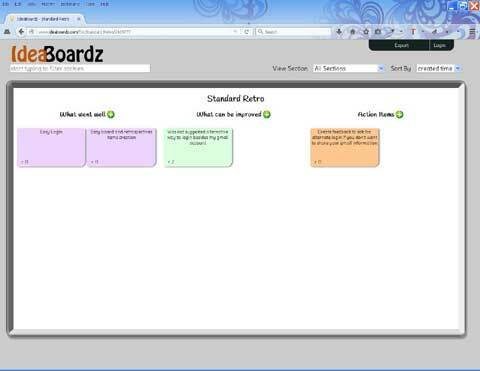 Stormboard provides many specific templates for different Agile and Lean boards (you can have a Scrum sprint or a Kanban board for instance) and has two templates specifically for Scrum retrospectives. The interface is rich with a good help system. As the interface, the card system is quite sophisticated compared to the tools that have only a free offer. A card can contains plain text, a video, a document or an index card. You can six different colors give additional meaning to your cards, for instance identifying which person or team created it. You can vote for every card on the board. Retrospective for distributed teams, here’s how…. ScrumDesk Start! integrates 17 retrospective techniques with voting for the best ideas. It is available for free at http://app.scrumdesk.com. Interesting list of tools, but the functionnalities are somewhat limited. Are there commmercial tools for distributed scrum retrospectives with more features? We use http://www.goReflect.com It works great for distributed teams as it has email and real-time capabilities. I use PlanningWith.Cards it has integrations to PM tools like JIRA, Trello & Pivotal Tracker, etc. Hi Jarvis, what kind of additional functionalities would you expect? I myself use http://www.scrum-toolkit.com which fits my needs perfectly. It might be… but as it is mentioned at the beginning, we list in this article only tools that have features specifically dedicated to Scrum retrospectives. Would love to see http://www.scatterspoke.com on this list, Free to use and easy to customize your retro format!